My greatest achievement thus far, is managing to avoid falling into any of the open sewers that are such an attractive feature of Jakarta. I’m proud of that but then I seem to remember a saying that ‘Pride comes before a fall’ so maybe I should think of something else? 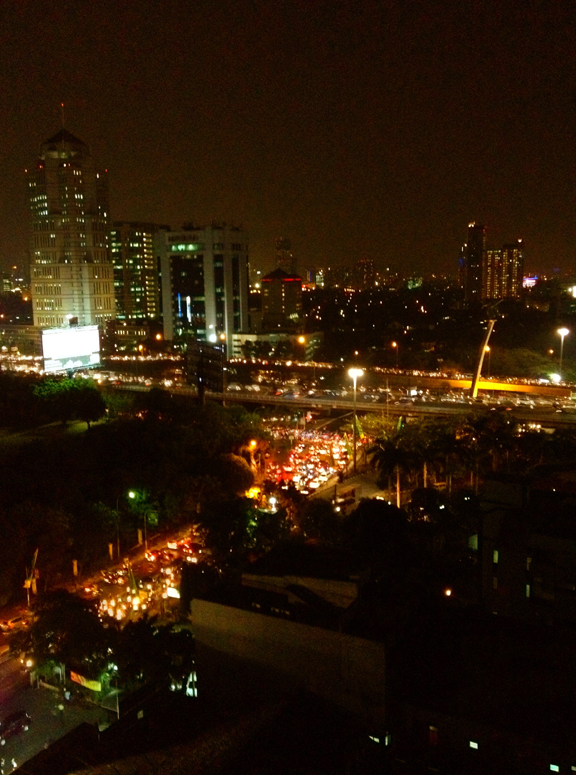 I’m proud of the fact that I haven’t gone totally mad from living in Jakarta. With the best will in the world, I doubt very much that it features on anyone’s bucket list of destinations but it’s our home for the moment so I’ve had to step up quickly to the mark and embrace the good, the bad and the ugly side of living here which if I’m honest, is not always easy. I’m also very proud and somewhat relieved of not getting run over trying to cross the notoriously busy Jakartan roads. Crossing any road here could be described as something of an extreme sport. It certainly helps to have a sense of humour and the patience of a saint, because you can bet your bottom dollar, that whatever you have planned for your day will not go smoothly. In case you were wondering, I have neither. How do you handle the attention you get from being a blonde, British woman in Indonesia? The blonde hair does get noticed, and that coupled with me being a good foot and half taller and at least 3 foot wider than most women here, makes me stick out like a sore thumb which sometimes I find difficult. We don’t live in an expat area of Jakarta so if I’m out and about walking, the sighting of another western women is a rare occurrence. In Bali it’s different because being a holiday destination there are plenty of blonde Australians, which means I blend seamlessly into the environment. Have you picked up any new habits since you’ve lived abroad? Ah, that’s an interesting question. Habits, yes, I’ve certainly picked up some new bad habits over the past year, wearing a dastah (Indonesian onesie) for example, which went down like a lead balloon with my husband. I’ve had to wean myself off wearing them as he gave me an ultimatum. Not enough exercise is another. Because of that, I am now almost spherical and resemble the apple motif on the front of my laptop. My best new habit is probably starting writing a blog. I’ve discovered so many great blogs in the past year, and since starting my own I’ve met up with other bloggers in the flesh so to speak and subsequently made some good friends. I also now write for an expat website, a glossy magazine in Jakarta, and best of all, I get emails from people who’ve stumbled across my blog on the internet and want advice on moving to Indonesia. I’m always delighted to hear from people and it’s a good feeling being able to offer advice, and help in any way that I can. Do you think you’ll ever get used to Indonesian bathroom culture? Never in a month of Sundays will I get used to Indonesian squat and drop type toilets. There’s something very off-putting about having to place ones feet on the ceramic paddles either side of it, and hover over a hole. After one too many Bintangs, it can also be a perilous balancing exercise. The sit down toilets aren’t a lot better because the seats are generally covered in dirty footmarks from the Indonesian ladies who don’t like sitting and prefer to scramble up onto the seat to squat. Not least the fact that toilet paper is rarer than hens teeth in these parts. Instead, there is an apparatus resembling something akin to a high-pressure hose that is supposed to be used for washing afterwards. I’ve never managed to use one without soaking the bathroom and myself from head to foot. Which is your favorite post from your blog? My favourite post? That’s quite difficult to answer because I’ve enjoyed writing all of them. I know that there have been certain posts that have proved popular with people who follow me, but I think My Pelvic Floor and Our Move to the 12th Floor is definitely one of my favourites. I like it when I can weave things that have happened in my past into what I am writing about here in Indonesia. What considerations should someone contemplate before moving abroad to Southeast Asia? I think it very much depends on where you are going to be living in S.E Asia. Thailand is different from Indonesia and so are Malaysia and especially Singapore. Indonesia is the largest modern Islamic state in the world. Culturally it is very different from the UK which is where I was brought up. It’s certainly important to do your homework before moving out here so my advice is check out expat websites, read expat blogs, and find out as much as you can about all the cultural differences, especially if you are moving from the west. Something that I read prior to our move, and at the time made very little sense to me but which nonetheless stuck in my mind, was the line ‘when moving to Indonesia give up on the idea of ever having any control over anything. If you need/want to be in control, you will not last 5 minutes here’ or words to that effect. Having lived here for just over a year, those words now make perfect sense to me. This entry was posted in Abroad Blogs of the Week and tagged Abroad Blog of the Week, Culture, Expat, Humor, Indonesia, Travel on November 21, 2012 by eliseblalock. Elise, thank you so much for inviting me to be your Abroad Blog of the week. Your kind words made me smile, and I feel very honoured, and flattered to have been featured on this post. Thank you, Lottie! I know others love your blog as much as I do. Thanks for reading, Steph! I’m glad to find a new blog too. What a wonderful surprise! and thank you. I’m glad you find my posts entertaining – it makes a real difference when I know that I’m not writing into thin air so to speak! P S Seen any ghosts lately? Nice interview & pick, Elise 😉 You can’t go wrong with Lottie, she’ll dazzle you with her humour and make you laugh till you fall over in tears…but you know that already! Agree! Like me, she is quite the fan of yours as well!